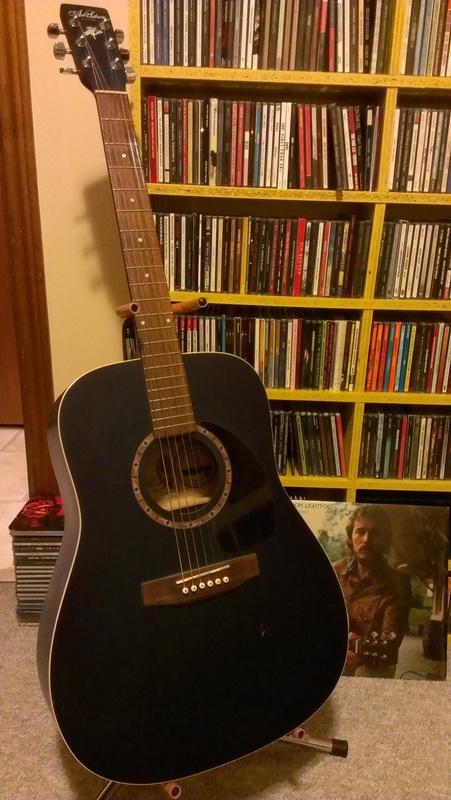 Following up on yesterday’s post, wherein we talked about my electric guitar (the full story of my gear to be found in a post from August of 2007), I now bring you my acoustic guitar. Electric is awesome, but sometimes (especially when writing songs, or often when I’m playing the blues) an acoustic is what’s needed. She’s a blue, Canadian-made Art & Lutherie (made by Godin) that was also quite inexpensive, especially considering the quality of this instrument. She has a cedar top, and a big, roomy sound. There’s great sustain at all times and, not unlike my Epiphone electric, she holds her tuning forever. 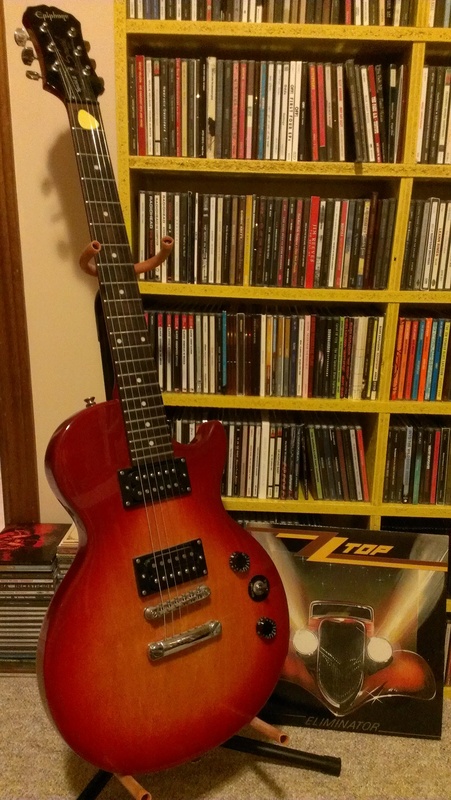 I toyed with the idea of installing an after-market electric pick-up, but decided to leave her pristine. This guitar does not currently have a name. My lovely wife said if I played this one long enough, a name would present itself. So far, though, this hasn’t truly happened. No matter, she’s a solid acoustic warrior, and my go-to guitar for all sorts of situations. I present to you my acoustic guitar! Two Canadian classics, side by side. There was talk, a while back, about guitars. I like talking about guitars! So I thought I’d share the gear I’ve got here. Now, AGES ago (in August of 2007, to be precise! ), I posted about the equipment I have here. None of this stuff has changed. The guitars, the amps, all of it. I am loyal to my guitars. So here’s my electric guitar. She’s an Epiphone Les Paul Special II, red with a sunburst middle. As noted in that link (above), my Saskatoon friends voted to name her Cherry Firecrotch. I love this guitar. She wasn’t expensive, but she plays well, has great tone, and (perhaps most importantly), she stays in tune for ages. A true pleasure to play, often for hours at a time. I give you: Cherry Firecrotch! Cherry and ZZ. A perfect match.